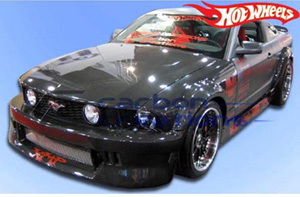 Most people, when they think of ground effects kits are just thinking of a body kit, but a good package not only improves the look of your already awesome Ford Mustang, it can improve the handling and road grip. Ground effects work at the front and back of your car to direct airflow and provide downforce. 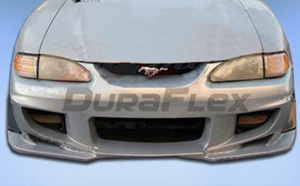 The front air dam or spoiler redirects oncoming air and through it's design, uses the air's pressure to exert downforce on the nose and front wheels of your pony car. A rear wing or spoiler catches the high velocity air moving over the roof of the car and guides it downward to make... yup you guessed it.. downforce. Pressure from the rear wing makes your back tires stick to the pavement even better at speed and the combination of the two forces, means better high speed handling. Think its all a marketing gimmick? Watch drag racing or indycar races and see what happens to a car when it loses a wing or its front spoiler. So Mustang ground effects really work. And they look good too! 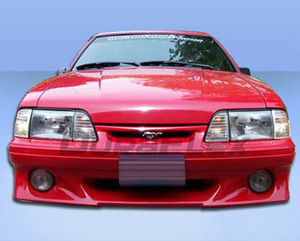 There are a huge selection of Mustang products available from cheap ground effects packages to complete wide body kits with full front and rear treatments. Here are a few to wet your whistle. 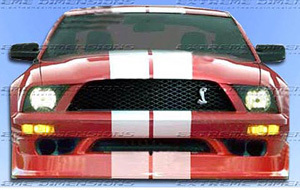 Obviously I can't show you all the choices out there, since there are a vast array of kits to fit your Ford Mustang no matter what the year, so here's a link to a lot more ground effects !